The Natchitoches Christmas festival started when Max Burgdorf, Natchitoches’ superintendent of the utility commission, came up with the idea that the community needed something extra to commemorate the Christmas season. He purchased several strings of lights which he strung along Front Street and created a festive display on the riverbank. No one is really sure why he did it. Was he visited by the Ghost of Christmas Yet To Come? Was he trying to light the way for Kris Kringle delivering gifts to the children of Natchitoches? Or was he just a kind-hearted soul that wanted to give back to the community he loved. Whatever his reasoning, 91 years later his gift has blossomed into a season of sparkle that delights generations of onlookers. 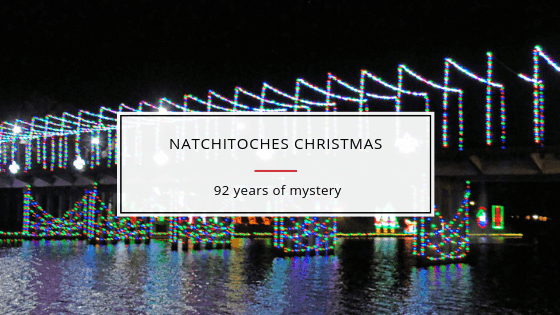 Thousands of visitors from around the world journey to Natchitoches every year for Christmas festivities and to view the over 300,000 lights strung from rooftop to rooftop and admire the 100 twinkling lighted scenes that line the Cane River Lake. Holiday-cheer seekers gather on the beloved and recently renovated Rue Beauport Riverfront boardwalk. The renovation included the addition of a festival stage, amphitheater seating, handicap ramps, restrooms, winding staircases, and a brick promenade designed to encourage leisurely strolls along the edge of the water. Every Saturday night at 7 pm from November 17 until January 6 the sky will be ablaze with the sights and sound of fireworks bursting and crackling over Natchitoches. November 17th is the kickoff to “Turn on the Holidays” with a day full of activities. Daytime activities include a Christmas Treasures Arts and Craft Show hosted by Les Amies – a woman’s civic service group dedicated to promoting the welfare of the Natchitoches community; and children’s games and activities along the Rue Beauport Riverfront boardwalk. As evening descends, people gather along the riverfront with their lawn chairs and blankets, trying to find the best vantage point for an evening of fireworks and live music. When the first stars of the night appear in the sky, the crowd knows that the “flip” is near and they exuberantly countdown to when a large toggle switch at the festival stage is flipped on, illuminating the town streets with brightly colored, twinkling lights. The nights’ festivities continue with live music into the night. Shops and restaurants along the Historic Front Street are open later accommodating shoppers and festival-goers that are looking for something to nibble on. There are many unique dining establishments from sushi and Asian Fusion to authentic Cajun and Creole dishes. Mama’s Oyster House and Papa’s Bar and Grill, located directly on Main St. Mama’s is an excellent place to grab fresh oysters and a cold hard cider; whereas Papa’s focuses more on dishes from the grill. The prices are very reasonable, the service is good, and there is live music every Friday and Saturday night. For some real Southern cooking try Cane River Commissary. A bit off the road so you will need to drive, but it is a favorite hangout for the locals, so you know the food is fabulous. They have Louisiana favorites like Chicken Fried Steak, Crawfish Po-boys, and bread pudding. Natchitoches welcomes its visitors with a variety of activities to celebrate Christmas – from the Sports Hall of Fame to tours of historic homes and buildings to the crowning of Miss Merry Christmas to 18th Century style Christmas at Fort St. Jean Baptiste – there is something for everyone. The Louisiana Sports Hall of Fame and Northwestern Louisiana History Museum displays memorabilia from over 300 Louisiana athletes and coaches celebrating their achievements and victories in the world of sports. The second floor, dedicated to the unique blend of cultural art and traditions mixed from the original inhabitants – the Native-American Caddo Indians and the French Creole settlers. For a bit of history, be sure to check out the Kaffie-Frederick Hardware Store. Opened in 1863 by Jewish Prussian immigrants, the store has been in its current location since the 1890’s and is the oldest continuously operated hardware store in Louisiana. Not only does the store still contain many of its original features such as the pully-lift elevator system, but it also sells many hard to find items of yesteryear. Another must-see is the Roque House on the edge of the Cane River Lake near the new Rue Beauport Riverfront boardwalk. The Roque House was built around the time of the Louisiana Purchase in 1803. It displays classic French Creole architecture with an oversized roof and a gallery porch. The walls are constructed of bousillage infill – a mixture of mud, Spanish Moss, and deer hair. If the thought of using “bousillage” is not impressive enough, then this should – there are no nails in the construction of this building. Natchitoches Christmas on the Cane, also known as Fe’te de Hiver, takes visitors to Fort St. Jean Baptist back in time to the 18th century. For a small entrance fee, you can experience how the early settlers celebrated Christmas with musket firing, military drills, and if you are lucky, a Christmas feast. This living history event at the state historic site recreates life in the original military trading post. Natchitoches is located off I-49 in the Northwestern part of Louisiana. Natchitoches has several types of lodging available. From historic 200-year-old homes now turned Bed and Breakfasts, to hotels, and campgrounds with RV hook-ups and tent sites. Natchitoches, a small town big on community, steeped with romantic charm from its red-brick cobblestone streets to its spacious balconies wrapped in filigree-style wrought iron railings. It is a town encased in French Creole history that is passionate about living life and Christmas. It is where you want to go for an unhurried Holiday season. Thank you for reading this travel nugget of knowledge about Natchitoches Christmas Festival of Lights. This article may contain an affiliate link or two, which does not affect you in any way, but will allow Empty Nestopia to continue to bring you travel tidbits.